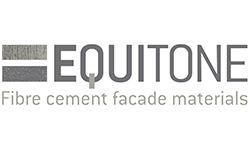 EQUITONE is a high-quality fibre cement material used for ventilated facades. Etex, the company that owns the EQUITONE brand, produces fibre cement materials in factories in Belgium and Germany since 1905. With experience in the production of fibre cement for more than 100 years, Etex is a true expert in the field of this material. Equitone panels are durable materials for refined, lightweight, easy-to-install fibre cement facades and virtually maintenance-free. Each panel is unique, underlining the natural, untreated texture of fibre cement base material, offering countless design possibilities. The state-of-the-art materials are color-coded, flexible, durable and lightweight and can be punched or engraved for impressive aesthetic effects. EQUITONE material is available as panels of up to 3.10m x 1.25m and can be transformed into any size or shape. Equitone panels are durable, with a pleasant visual appearance, which, besides having an aesthetic contribution, they behave well in different weather conditions, and help reduce maintenance costs and improve sound insulation. Architects and developers around the world appreciate Equitone materials, supported by a rich portfolio of public and private buildings fitted with our panels.